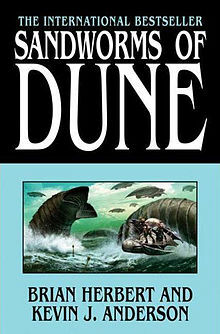 My first reaction upon finishing Sandworms of Dune was that, unlike Hunters of Dune, it at least it has a plot. In Hunters of Dune, we learned that the Ominous Threat™ is actually the Thinking Machines from the Butlerian Jihad. This reveal came out of nowhere. The struggle between man and machine is a classic sci-fi trope, but it’s not a theme that appeared at the forefront of the Dune saga. In fact, in Dune, it appeared that humanity had solved the problem thousands of years before by replacing computers with Mentats. I haven’t read Brian Herbert and Kevin J. Anderson’s Butlerian Jihad trilogy so I’m probably missing some important context. However, requiring readers to have read a prequel trilogy seems like a poor storytelling choice. Sandworms of Dune needed to do more to show me how the “man vs. machine” thread fit into the Dune saga. I fell in love with Dune because of its complex characters and political intrigue, but Sandworms of Dune boils down to yet another struggle between men versus the machines. Evil robots don’t provide many opportunities to explore the themes of religion, charismatic leadership, and corruption that made Frank Herbert’s works so rich with meaning. Fortunately, in Sandworms of Dune, the gholas have all grown up and actually do something. Unfortunately, most of them don’t do anything particularly interesting. Which brings us back to the original question: why werethese gholas resurrected? Sheeana claims it’s to help the coming battle with the Ominous Threat™. Yet, they seem largely secondary to the conflict. Admittedly, some of the ghouls have some nice character moments. Dr. Wellington Yueh struggles with guilt for betraying Duke Leto in a previous lifetime. He has nothing to do with the larger plot, but his scenes provide us insight into the Yueh, which I appreciated. Overall, I’m glad Brian Herbert and Kevin J. Anderson wrapped up the Dune saga and gave it a proper end, even if the ending doesn’t live up to hype. It would have been a tragedy if we never learned what happened at the end of this epic saga. This concludes my journey through the Dune saga… until Denis Villeneuve’s planned film adaptation comes out. I am glad to hear that the ending made no sense to you on its own. I HAD read the Butlerian jihad books before these so I was already polluted, as it were. I’ve often wondered what I would have thought of this duology on its own and I suspect I’d be in the same camp as you. Do you think you’ll ever do some movie reviews of the various incarnations of Dune? It was an odd approach to writing a sequel. Frank Herbert apparently had no intent to write a prequel before he wrote Dune 7, so why did Brian and KJA feel the need for the Butlerian Jihad books? Why root so much of the conclusion to Frank Herbert’s story in their prequels? I reviewed the Lynch and Sci-Fi Channel movies a few months ago. Definitely looking to the new adaptation coming out in 2020. I was thinking of even starting a podcast about Dune and discussing issues of adaptation that might come up. Cash grab, as far as I’m concerned.